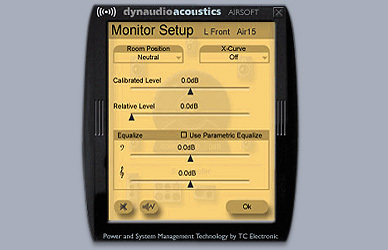 AIR SOFT is a software remote control application that runs both on MAC’s and PC’s. It is intended for convenient daily operation and enables users to control AIR system parameters and presets real time. Moreover AIR SOFT can be used to back-up settings as well as to upload new software to AIR components. A ‘TC Link to Serial Port’ converter-cable is included with AIR SOFT. Users without a serial port on their Computer should acquire a USB to serial port converter.